Do you remember hearing bells as a child? An alarm bell woke us up. The doorbell meant someone was visiting. Bells outside called us to worship. A bell at the altar meant it was time for communion. A tinkling bell might make us look out for a bicycle or tricycle coming our way. A ringing bell called us to class or told us recess was over. We were told in the movie "A Wonderful Life" that every time a bell rings an angel gets its wings. Some families sat down to eat soon after a dinner bell rang. A series of chimes and bells coming down the street meant that the ice cream truck would soon be driving down our street. Just like Pavlov taught his dogs, those bells called us to action or caused our stomachs to growl. I had not thought of bells for many years until I traveled with my wife to Taiwan for the first time. The streets were filled with motorcycles and bicycles of all kinds. The first bells I heard there were the tinkling bells on the bicycles. "Look out! We are riding down the street - or down the sidewalk. Pay attention." the bells said. On a Sunday morning I heard church bells calling worshippers, a rare sound in a country with a small percent of Christians to answer those calls and go to church. But, no bells spoke to me like the bells that called me on my third night in Taiwan. A bell rang in my head when I arrived in Taiwan. It was a memory bell calling to my mind the words of my mother when I was a boy. "Never eat food in a strange place." my mother said. "You might get sick." Wow, I could not afford to get sick. I was in Taiwan to tell stories and to give programs at schools and libraries and to give teacher workshops. Taiwan was so beautiful. Yet it was strange to me. The smells were different. The foods were different. The entire culture was different than where I grew up. Alarm Bells went off. My mother's words came back to me. "You might get sick." I was afraid of getting sick. So, I did not eat or ate very little. Giving high energy programs and not refueling with adequate food set off another bell in my head. I needed food. I was hungry. My wife was hungry. We were in a land with more restaurants per capita than nearly anywhere in the world. We were in a place that is a Mecca for food. The food in Taiwan acts like a calling card - bringing visitors from all around the world. Yet - my wife and I were afraid to try the food. How sad! The third night of our trip we heard a gentle sound that made our stomachs growl We heard chimes and bells coming down the street from the Night Market, close to our hotel. Memories of childhood told us the bells we heard were an answer to our prayers. The sound was not strange. The sound was safe. The bells meant an ice cream truck was nearby. We ran down the streets of the Night Market, chasing the truck that played those bells. The bells meant the end of hunger. We ran as people stared at two very strange Americans in a sea of beautiful Asian faces who were buying and selling bits of everything in the Night Market. A block ahead - a half of a block and then close enough to touch. The bells were ringing. The truck stopped. It stopped in the middle of an intersection. 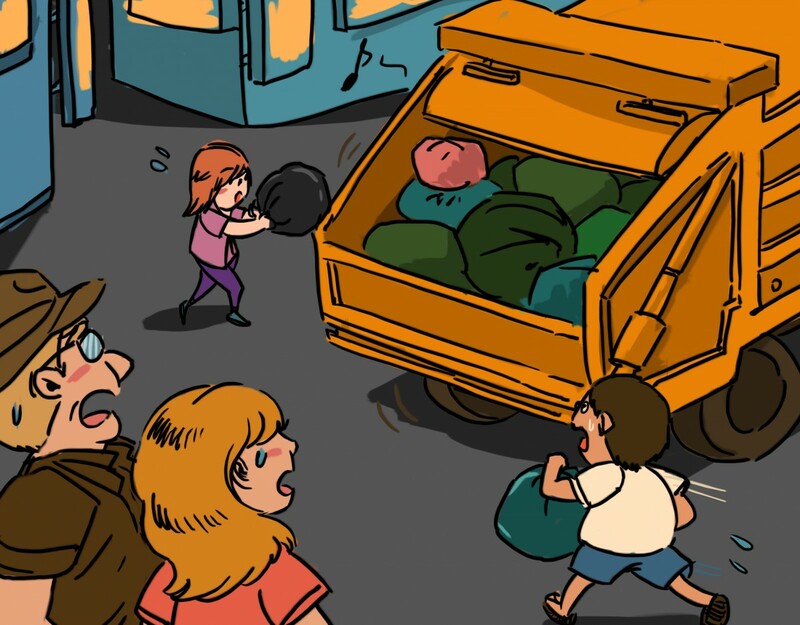 The bells rang, and everyone ran out of their houses and shops to dump their garbage in the back of that truck. It was a garbage truck. Pavlov's dogs would have loved the food that filled that truck. We did not. We were crazy Americans who passed by wonderful foods to listen to a bell that did not call us to dinner, but instead called us to a truck filled with garbage. Hunger caused us to look at the stalls of the food vendors in that Night Market. We did more than look. We started with simple foods, noodles and breads, fruits and vegetables and later to meats and dishes of all kinds. My mother was wrong. I did not get sick. The alarm bells quit ringing. I ate and continue to eat foods placed before me in Taiwan. It no longer looked strange and different. It looked beautiful. It smelled delightful. It tasted better than most foods I have eaten anywhere. It no longer takes a dinner bell to call me to dinner any longer. And do you know what else? This crazy American does not eat near as much ice cream. Dr. Mike Lockett is a storyteller and children's author. He has toured eastern Asia multiple times. He is available for school programs, assemblies and young author programs. Contact Dr. Lockett for bookings at Mike@mikelockett.com.